High glycemic-index foods increase your risk of depression. Certain kinds of carbs can have a negative impact on your brain, resulting in an emotional health dip. A 2015 study published in the American Journal of Clinical Nutrition found that post-menopausal women who eat foods with a high glycemic index, meaning refined carbohydrates like white bread and rice, cornflakes, and potatoes, have a higher incidence of new-onset depression. Conversely, the more lactose, fiber, non-juice fruit, and vegetables study participants ate, the less likely they were to get depressed. The connection: Foods with a high glycemic index make your blood sugar shoot up suddenly, causing your body to produce a spike of insulin, says Kristin Kirkpatrick, M.S., R.D., Manager of Wellness Nutrition Services at Cleveland Clinic Wellness Institute. Consumption of highly refined carbs is linked to fatigue, mood swings, and other symptoms of depression, she says. The reason why blood sugar can have a lasting effect on your mood still isnt understood by the scientific community, but the strong correlation should make you think twice before dining on bread and pasta alone. Tip: If you want to indulge in a high glycemic-index food, make sure eat a sensible portion and pair it with a low glycemic index food, such as fruits, vegetables, legumes, or whole grains, to mitigate a blood sugar spike, according to the American Diabetes Association. Sugar reduces cognitive flexibility, as well as short- and long-term memory. Opting for orange juice instead of soda may seem like a healthy choice, but when it comes to sugar delivery, fruit juice is as big a culprit as cola and that extra sugar could compromise your brain function. A 2015 study in the journal Neuroscience shows that mice subjected to high-sugar and high-fat diets ended up with significant cognitive decline. Their long- and short-term memory took a hit, as did their cognitive flexibility, described as the ability to problem-solve in the face of new information. The high-sugar diet group showed the biggest declines in brain function, especially cognitive flexibility. To figure out why, researchers examined the gut bacteria present in the mice before and after their new diets. They found substantial changes: One bacteria, Clostridiales, flourished in the high-sugar environment, while another, Bacteroidales, was reduced. This work suggests that fat and sugar are altering your healthy bacterial systems, and thats one of the reasons those foods arent good for you, said lead study author Kathy Magnusson in an article on the Oregon State University website. Its not just the food that could be influencing your brain, but an interaction between the food and microbial changes. Foods high in saturated fat hurt your memory and cause inflammation in the brain. Cheese, followed by pizza, are the two biggest sources of saturated fat in the American diet, says the Harvard School of Public Health. Not only do high-fat diets correlate with poor memory (as shown in the Neuroscience study), but they are also shown to injure your hypothalamus, a part of the brain that helps control body-weight regulation, according to a 2011 study in the Journal of Clinical Investigation. After determining that rodents fed a high-fat diet (60% of calories from fat) sustain injury to their hypothalamus due to increased inflammation, researchers examined brain images of obese humansand found injured brain cells in the exact same region. In other words, eating a high-fat diet hurts your brains ability to regulate the food you take in, making you prone to obesity. A high-fat diet also promotes inflammation elsewhere in the body, including your arteries, which can increase your chance of stroke, says Kirkpatrick. Think about inflammation of circulatory systemthe same arteries flowing to the heart go up into the brain, she explains. Lets say you have horrible high-fat diet. You might have a heart attack, but you might have blockage in the arteries leading to your brain. Fried foods increase your risk of developing Alzheimers disease. In terms of brain danger, eating too much fried food is related to saturated fat and cholesterol. The saturated fat in fried food is shown to damage the blood-brain barrier, says Martha Clare Morris, ScD, Professor and Director, Section of Nutrition & Nutritional Epidemiology, Department of Internal Medicine, Rush University. One interesting observation from animal models is that it seems that diets higher in saturated fats disrupt the blood-barrier, says Dr. Morris. The barrier is a complex transport system for nutrients into the brain, she explains. When its disrupted, it can allow harmful substances to get in and perhaps injure the brain. It can also disrupt the uptake of nutrients that are important for brain function. In addition, fried food is also known to increase blood cholesterol levels. Cholesterol is a central dietary component in the development of Alzheimers disease, she says. Theres a link between blood cholesterol levels and dementia. A 2014 study in the Journal of the American Medical Association revealed that people who have high levels of bad (LDL) cholesterol and low levels of good cholesterol (HDL) are more likely to have a build-up of beta-amyloid proteins in their brain, which are harbingers of Alzheimers disease and dementia. More research needs to be conducted to figure out whether high cholesterol is a cause or a result of Alzheimers progression. Trans fats hurt brain function and memory. While the FDA aims to completely eradicate trans fats from the food supply by 2018, many foods still contain a hefty amount of this damaging fat, which remains solid at room temperature. 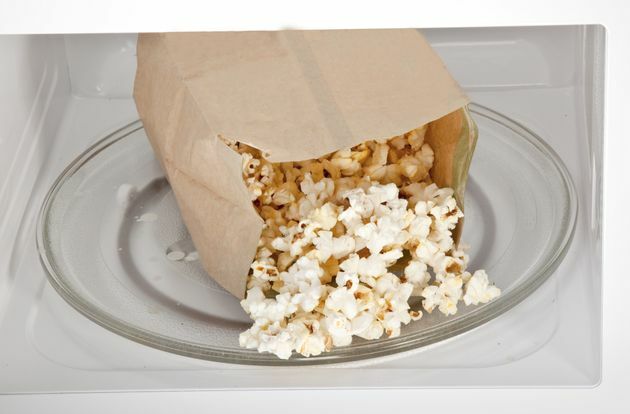 The top offenders right now include stick margarine, frosting, frozen pizza, refrigerated dough, coffee creamer, and microwave popcorn. A 2011 study in the journal Neurology exposed two scary consequences of eating too much trans fat: less favorable cognitive function and less total cerebral brain volume. Furthermore, a 2014 study of 1,000 men found that participants who ate more trans fat performed worse on memory tests. Though experts believe more studies are needed to confirm the role trans fat plays in brain health, the well-established dangers of trans fats should be enough motivation to kick the stuff. In an analysis of 50 studies on trans fats, a recent review found that high-trans fat diets raise your risk of dying from heart disease by 28 percent, and from any cause by 34 percent. Eating a high trans-fat diet will increase bad cholesterol and decrease good cholesterol, so its a double whammy, says Dr. Morris. In one study, we found that even a moderate intake of trans fat is worse than a high intake of saturated fats. Want to do everything you can to minimize your chance of getting Alzheimers Disease? Research has found that a new diet, known as MIND, can lower your Alzheimer’s risk by 35-53%, depending on how rigorously you stick to it. A hybrid of the Mediterranean Diet and the American Heart Association-endorsed DASH diet, MIND relegates 15 primary foods into brain-healthy and brain-unhealthy categories. Basically, you should limit saturated fats and sugar, eat fruits, veggies, and whole grains often, and include fish in at least one meal a week, says Dr. Morris, who co-authored the MIND Diet study. And if you absolutely love French fries or pizza or other foods designated as unhealthy? I wouldnt say stop eating them, because some people really like those food items, she says. You should just restrict them. Maybe those foods can be your weekly treat. Youll probably like them even better that way.